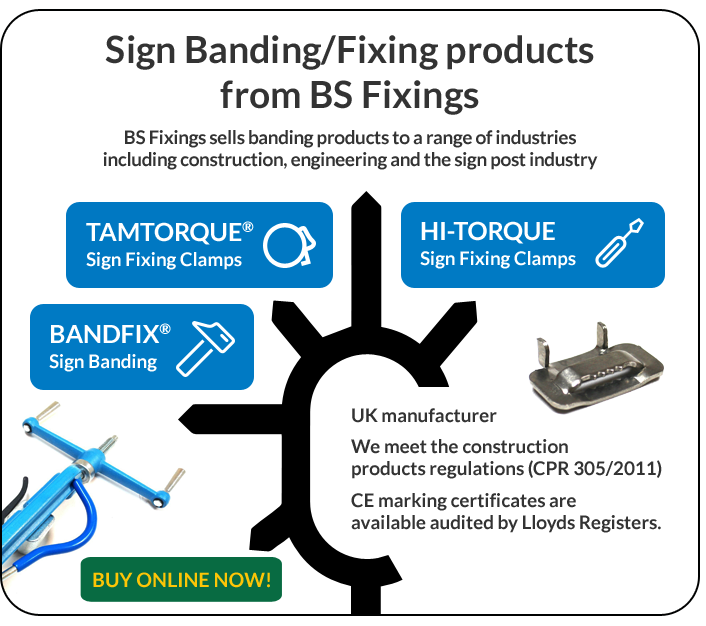 To secure anything – a sign to a post, a bin to a fence - with simplicity and cost-effec­tiveness, choose from the selection by visiting BS Fixings now! Sign banding is of major importance - you may not notice it but it is all around you every day. Signage and other street furniture is expensive and must be protected and stainless steel sign banding has been proven time and time again to do the job strongly, safely and precisely. We have worked hard to build powerful partnerships with some of the biggest names in the business, including JCS Hi-Torque (Tamtorque). This world-renowned company has seen its reputation soar as the product is used across an array of applications from construction and engineering to catering and warehousing. Quality is absolutely guaranteed from the first metre of banding to the last, with no lack of consistency whatsoever in between. Approvals such as ISO9001, CE Marking, BSI Kitemark and Lloyd's Register Type are your confirmation of professional product, every time. We also manufacture Bandfix, our very own range of stainless steel banding and fixing. The products are made solely in the UK and work seamlessly in conjunction with one another to offer the ideal fixing solution for many applications. The family of products, along with the stainless steel banding itself, includes all of the necessary components for perfectly professional results: buckles, seals, universal clamps, screw buckles and banding tools. For all of your fixing and fastening needs, including stainless steel screws & nails, nuts & bolts and stainless steel welding wire, head on over to BS Fixings today!